Welcome to Grapevine Physical Therapy & Sports Medicine's patient resource about ankle problems. The ankle joint acts like a hinge. But it's much more than a simple hinge joint. The ankle is actually made up of several important structures. The unique design of the ankle makes it a very stable joint. This joint has to be stable in order to withstand 1.5 times your body weight when you walk and up to eight times your body weight when you run. Normal ankle function is needed to walk with a smooth and nearly effortless gait. The muscles, tendons, and ligaments that support the ankle joint work together to propel the body. Conditions that disturb the normal way the ankle works can make it difficult to do your activities without pain or problems. 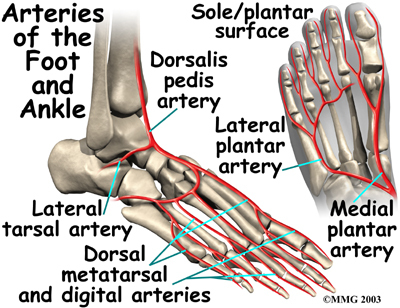 The top of the foot is referred to as the dorsal surface. The sole of the foot is the plantar surface. The ankle joint is formed by the connection of three bones. The ankle bone is called the talus. The top of the talus fits inside a socket that is formed by the lower end of the tibia (shinbone) and the fibula (the small bone of the lower leg). 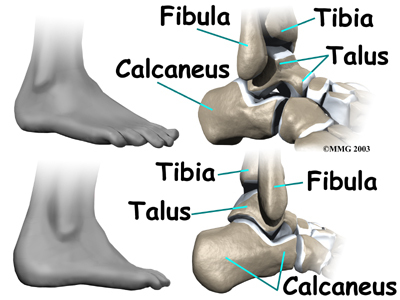 The bottom of the talus sits on the heelbone, called the calcaneus. The talus works like a hinge inside the socket to allow your foot to move up (dorsiflexion) and down (plantarflexion). Woodworkers and craftsmen are familiar with the design of the ankle joint. They use a similar construction, called a mortise and tenon, to create stable structures. They routinely use it to make strong and sturdy items, such as furniture and buildings. Inside the joint, the bones are covered with a slick material called articular cartilage. Articular cartilage is the material that allows the bones to move smoothly against one another in the joints of the body. The cartilage lining is about one-quarter of an inch thick in most joints that carry body weight, such as the ankle, hip, or knee. It is soft enough to allow for shock absorption but tough enough to last a lifetime, as long as it is not injured. Ligaments are the soft tissues that attach bones to bones. Ligaments are very similar to tendons. The difference is that tendons attach muscles to bones. Both of these structures are made up of small fibers of a material called collagen. 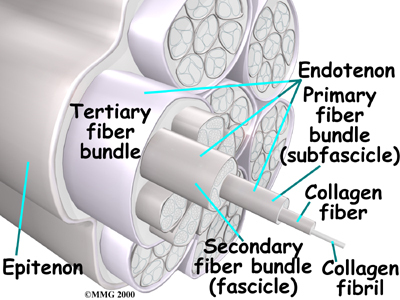 The collagen fibers are bundled together to form a rope-like structure. Ligaments and tendons come in many different sizes and like rope, are made up of many smaller fibers. Thickness of the ligament or tendon determines its strength. 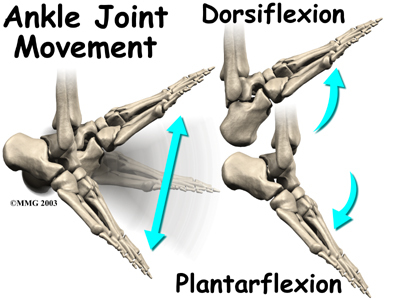 Ligaments on both sides of the ankle joint help hold the bones together. 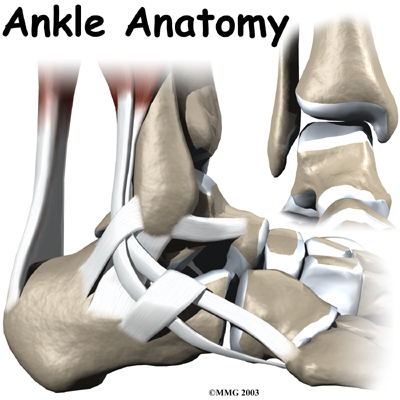 Three ligaments make up the lateral ligament complex on the side of the ankle farthest from the other ankle. (Lateral means further away from the center of the body.) 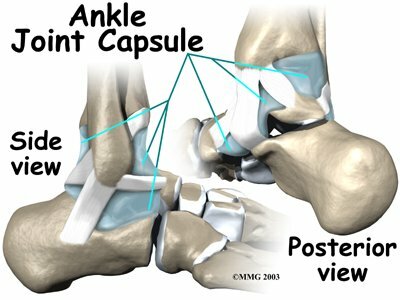 These include the anterior talofibular ligament (ATFL), the calcaneofibular ligament(CFL), and the posterior talofibular ligament (PTFL). A thick ligament, called the deltoid ligament, supports the medial ankle (the side closest to your other ankle). Ligaments also support the lower end of the leg where it forms a hinge for the ankle. This series of ligaments supports the ankle syndesmosis, the part of the ankle where the bottom end of the fibula meets the tibia. Three main ligaments support this area. The ligament crossing just above the front of the ankle and connecting the tibia to the fibula is called the anterior inferior tibiofibular ligament (AITFL). 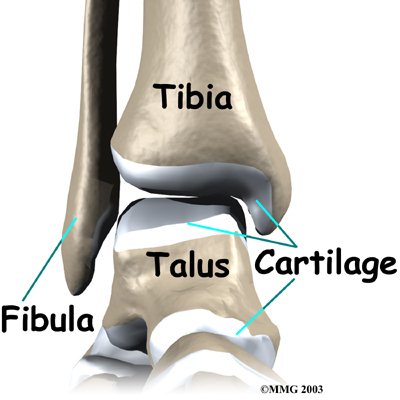 The posterior fibular ligaments attach across the back of the tibia and fibula. 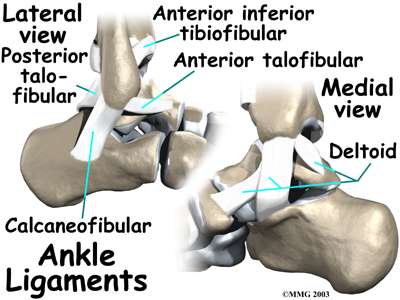 These ligaments include the posterior inferior tibiofibular ligament (PITFL) and the transverse ligament. The interosseous ligament lies between the tibia and fibula. (Interosseous means between bones.) The interosseus ligament is a long sheet of connective tissue that connects the entire length of the tibia and fibula, from the knee to the ankle. The ligaments that surround the ankle joint help form part of the joint capsule. A joint capsule is a watertight sac that forms around all joints. It is made up of the ligaments around the joint and the soft tissues between the ligaments that fill in the gaps and form the sac. 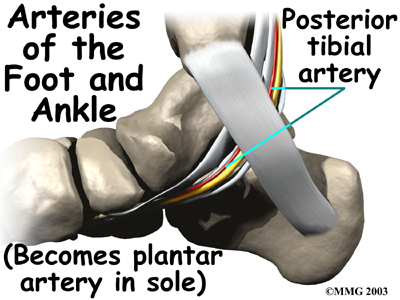 The ankle joint is also supported by nearby tendons. The large Archilles tendon is the most important tendon for walking, running, and jumping. It attaches the calf muscles to the calcaneus (heelbone) and allows us to raise up on our toes. 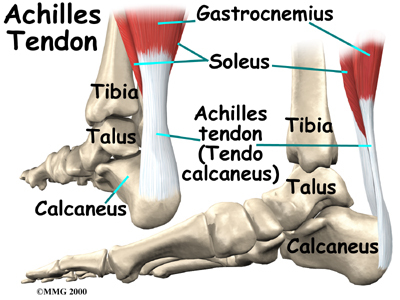 The posterior tibial tendon attatches one of the smaller muscles of the calf to the underside of the foot. 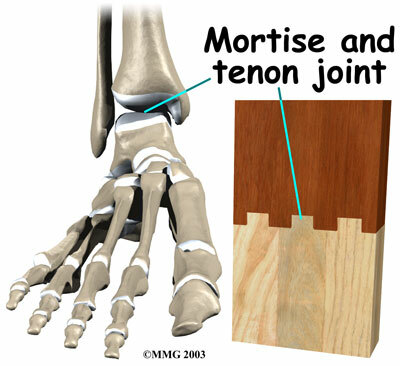 This tendon helps support the arch and allows us to turn the foot inward. The anterior tibial tendon allows us to raise the foot. 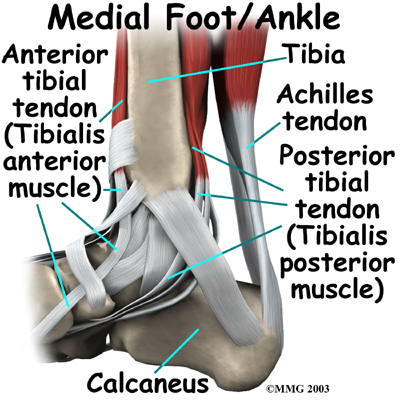 Two tendons run behind the outer bump of the ankle (the lateral malleolus). These two tendons, called the peroneals, help turn the foot down and out. Most of the motion of the ankle is caused by the stronger muscles in the lower leg whose tendons pass by the ankle and connect in the foot. Contraction of the muscles in the leg is the main way that we move our ankle when we walk, run, and jump. The key ankle muscles have been discussed earlier in the section on ligaments and tendons. These muscles and their actions are also listed here. 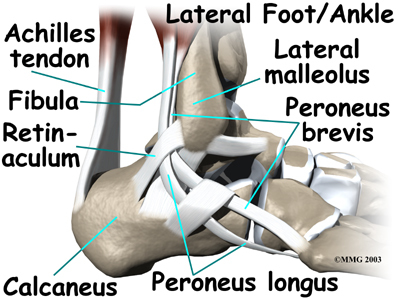 The peroneals (peroneus longus and peroneus brevis) on the outside edge of the ankle and foot bend the ankle down and out. The calf muscles (gastrocnemius and soleus) connect to the calcaneus by the Achilles tendon. When the calf muscles tighten, they bend the ankle down. The posterior tibialis muscle supports the arch and helps turn the foot inward. The anterior tibialis pulls the ankle upward. 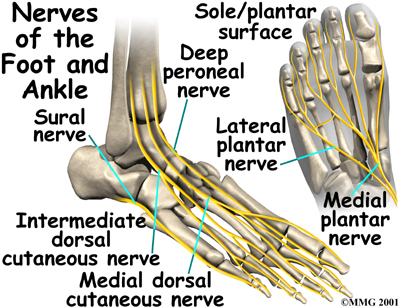 The nerve supply of the ankle is from nerves that pass by the ankle on their way into the foot. The tibial nerve runs behind the medial malleolus. Another nerve crosses in front of the ankle on its way to top of the foot. 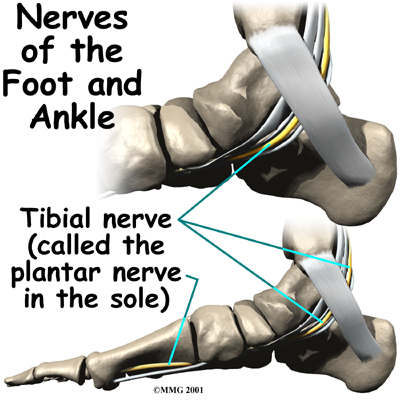 There is also a nerve that passes along the outer edge of the ankle. The nerves on the front and outer edge of the ankle control the muscles in this area, and they give sensation to the top and outside edge of the foot. The ankle gets blood from nearby arteries that pass by the ankle on their way to the foot. The dorsalis pedis runs in front of the ankle to the top of the foot. (You can feel your pulse where this artery runs in the middle of the top of the foot.) Another large artery, called the posterior tibial artery, runs behind the medial malleolus. It sends smaller blood vessels to the inside edge of the ankle joint. Other less important arteries entering the foot from other directions also supply blood to the ankle. As you can see, the anatomy of the ankle is very complex. When everything works together, the ankle functions correctly. When one part becomes damaged, it can affect every other part of the ankle and foot, leading to problems.